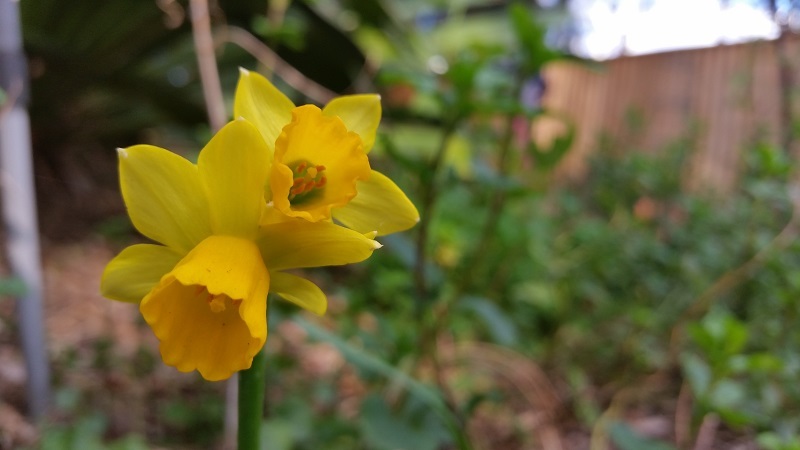 We also had unexpected floral guests — someone transplanted daffodils into the herb bed during winter. Given the long slow growing season, we’re not ready to start planting out the summer crops. 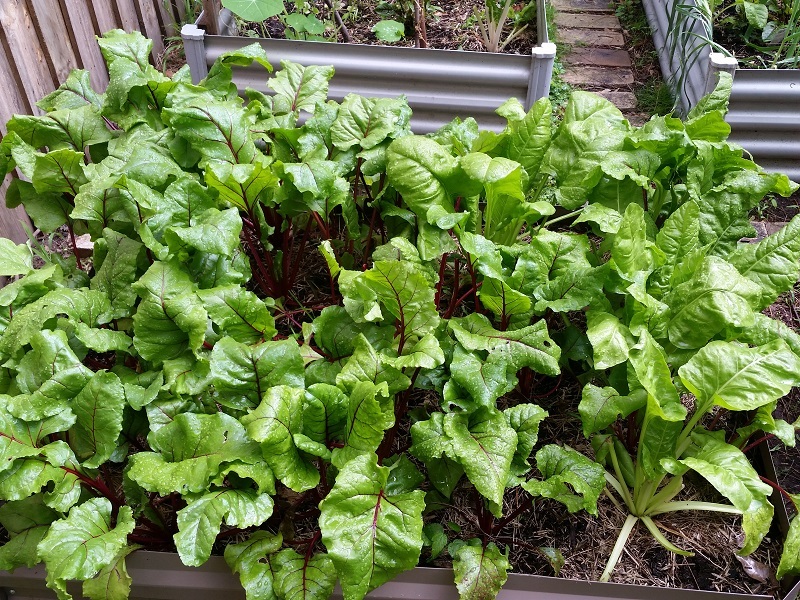 The greens are still prolific, the broad beans are only just flowering, and the beetroot still has to fatten up a bit more before it’s ready to harvest. 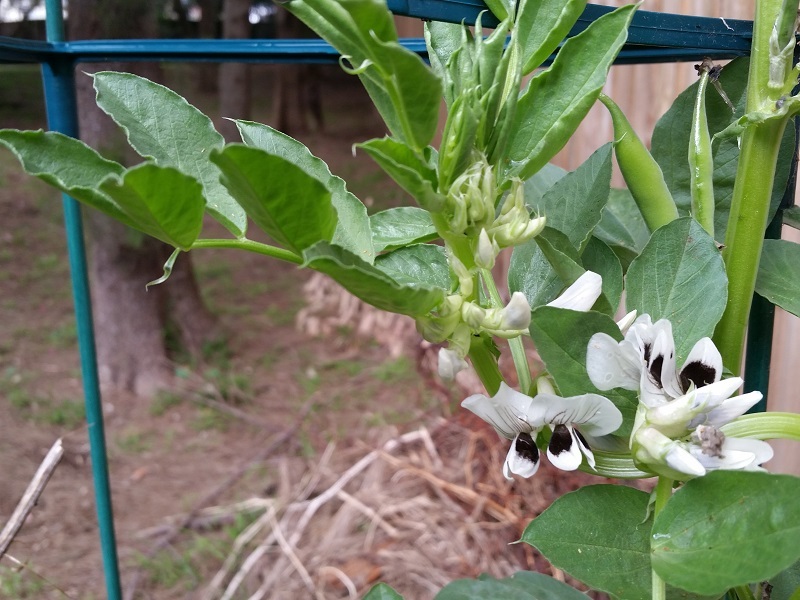 Lots of flowers, so far only a few beans forming. Did you know you can eat beetroot leaves? 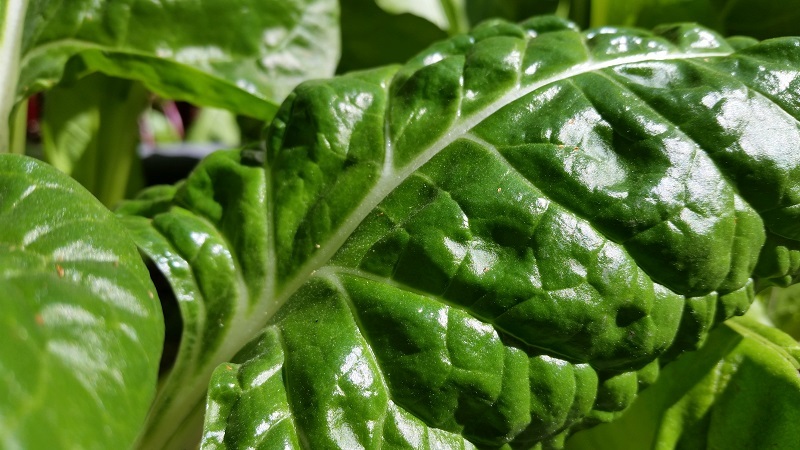 Just cook them as you would spinach or silver beet. You can even mix them up and cook all these kinds of leaves together. There’s still plenty to be done though, so today a few of us met up to make plans for spring planting and do a couple of between-season jobs. The most important of these was to take soil samples. The inner west of Sydney is, unfortunately, notorious for polluted soil, with high levels of lead and zinc (you can see a map here). The apartment complex we live in is only about 20 years old, and before that, Carlos, who’s lived in the area all his life, told us today, it was a holding yard for the railways — who knows what kind of contaminants are lurking under the surface? 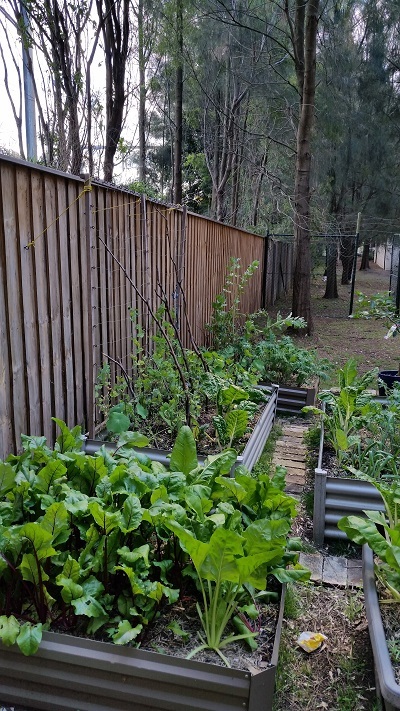 Most of our vegies and herbs are planted in raised beds, but we would like to make more use of the rest of the garden area. Last spring we planted mint, parsley, chillies and aloe vera, but we agreed that before we plant anything else, we should check the soil quality. Meg and Carlos bag up some soil for testing. 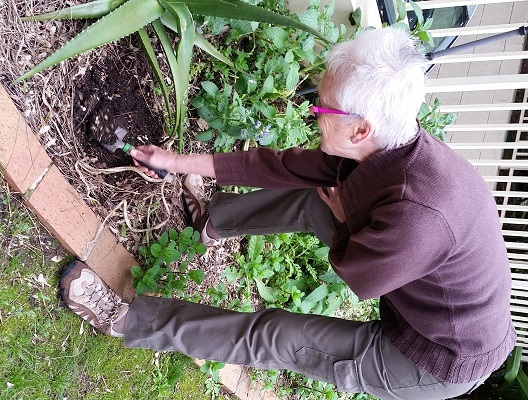 We took soil samples from 5 different locations around the garden and bagged them up to send off for testing by the Vegesafe project at Macquarie University. This is a free service because our soil samples provide data for a research project. 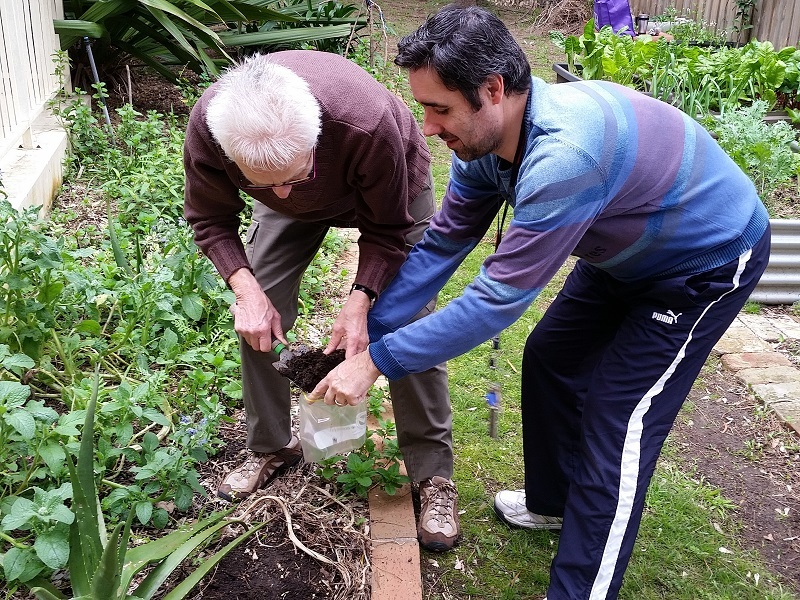 Vegesafe maps soil contamination in Sydney, feeds information back to the community and provides suggestions for how to garden if your soil turns out to be contaminated. Their motto is “Carry On Gardening“. Well, we definitely want to do that. After sampling the soil we moved onto another slightly icky but important task: refreshing the worm farms. 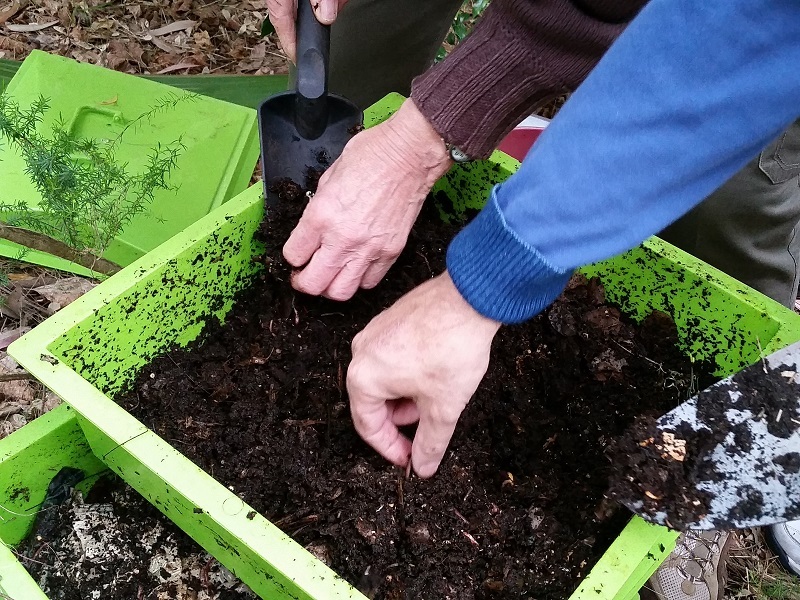 We’ve had two worm farms going almost since we began the garden a year ago, and it was time to clear out the soil they’d created, which will enrich our garden beds when we do our final harvest in 2-3 weeks time and then prepare the beds for summer crops. The catch is — you have to make sure the worms stay in the farm and they don’t all leave with the soil! 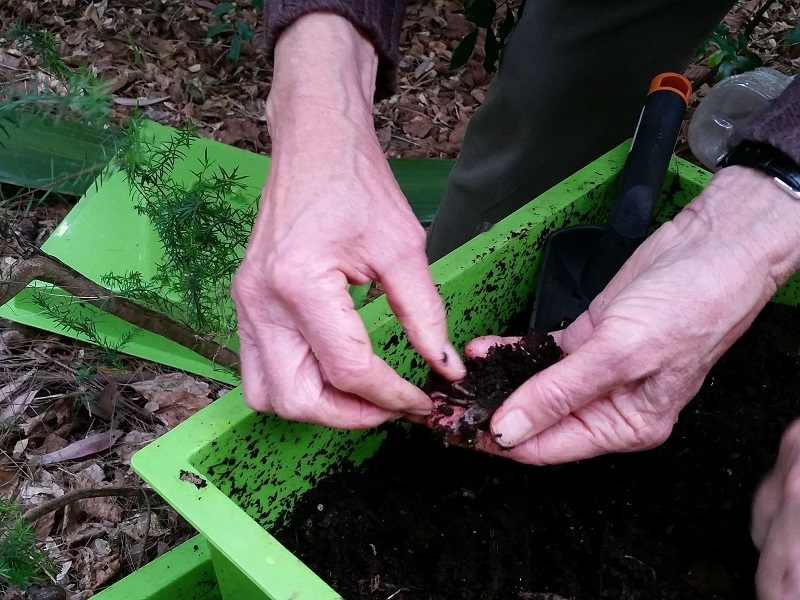 The only way to do this is to laboriously turn over the soil and pick them all out … by hand. In the case of the older worm farm, this wasn’t too difficult. 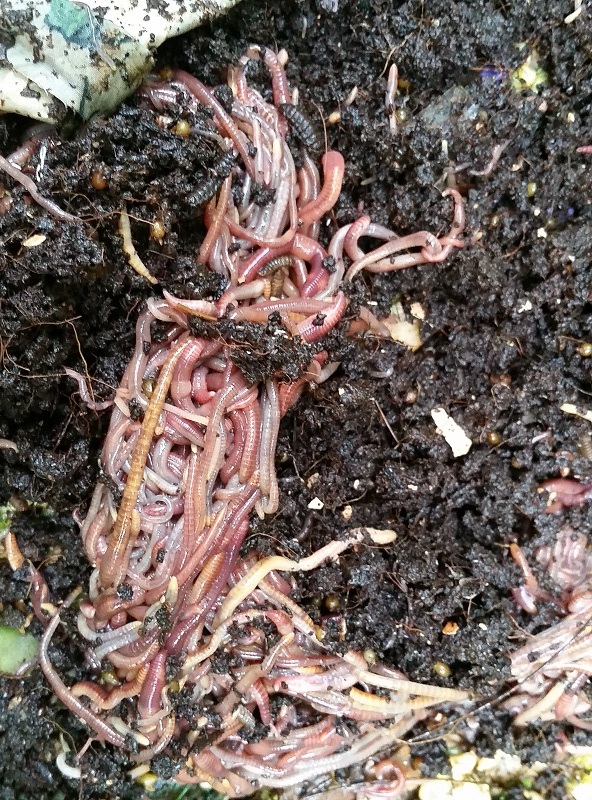 Most of the worms seemed happily settled in among the vegie scraps and there weren’t very many in the soil tray. The newer farm (pictured) was another story. The worms had been busily reproducing and there were clumps of babies all over the place. By the time we’d finished we felt there were more worms than soil. We’re very happy that the worms are so content that they’re reproducing madly. This means we have enough worms to populate a third worm farm which we’ve been given. All the more room for our kitchen scraps, although I’ve no idea how we’ll cope with the massive increase in worm juice — we already have around 20 litres decanted! I guess we’ll just have to keep expanding our garden empire.